A ‘ONCE in a lifetime’ Hieronymus Bosch exhibition has smashed visitor records at Spain’s Prado Museum. Showcased in Madrid, some 600,000 art lovers cast their eyes over the largest-ever collected body of works by the Dutch artist. Running from May through to the end of September, The 5th Centenary Exhibition breaks the record for the most visitors at Spain’s top gallery. The previous most popular exhibition was a collection of works by Spanish artist Diego Velazquez which attracted over half a million visitors in 1990. In fact, demand was so strong that museum officials extended opening hours to as late as midnight on some weekends. 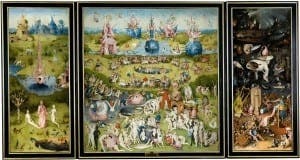 Known as El Bosco in Spanish, Bosch has long been a favourite with the public with his 15th century painting, The Garden of Earthly Delights, attributed to inspiring the surrealist movement in Spain.